Pope Liberius is also a protagonist of the famous legend concerning the church’s founding, which has given it another one of its titles, “Our Lady of the Snows.” The story is that a wealthy Roman patrician named John and his wife, having no heirs, wished to leave their patrimony to the Virgin Mary, and prayed to Her to let them know how they might do so. 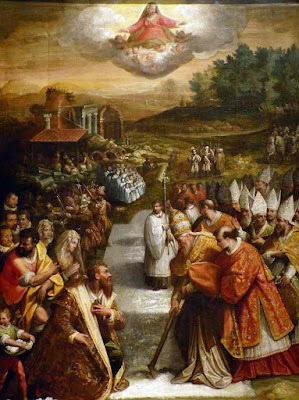 On the night of August 4th, the Virgin appeared to both of them, and also to the Pope, and told them that in the morning, they would find a part of the Esquiline hill covered in snow, and in that place they should build a church in Her honor. (Snowfalls are exceedingly rare in Rome even in the winter.) The next morning, coming up to the Esquiline, they did indeed find the place covered in snow, and thus the church was founded. Each year, during the principal Mass of the Dedication, a shower of white jasmine petals, representing the miraculous snowfall, is let fall from the roof of the basilica during the Gloria; the ceremony is repeated in the evening during the Magnificat of Vespers. It is seen here in a video taken by John Sonnen of Orbis Catholicus in 2010. Painful as it is to impugn the story behind such a beautiful liturgical tradition, it is now regarded as purely legendary. The text of Pope Sixtus III’s dedicatory inscription is preserved, and does not mention it; indeed, the story is not heard of until several hundred years after it supposedly took place. The legendary character of the episode is also implicitly recognized in the Tridentine liturgical reform. In a Roman Breviary printed in 1481, the story is told in six unusually long lessons at Matins, each almost a full column in length; the Breviary of St Pius V preserves the essence of the legend, but reduces it to the bare facts at just over 200 words. The feast also had a proper collect, which reads as follows: “O God, who, to declare the glory of Thy Mother, the glorious Virgin Mary, by a snowfall in the heat of summer didst deign to show forth the place in which a church should be built for Her; grant, we ask, that, devoting ourselves to Her service, by the cooling of concupiscence, we may be cleansed in the brightness of innocence.” In the Tridentine reform, this prayer was replaced by the generic prayer from the common Office and Mass of the Virgin. The upper left section of the mosaic on the triumph arch of Saint Mary Major, with the Annunciation above and the Adoration of the Magi below. To the right of the Annunciation, the angel comes to reassure St Joseph. In the Adoration of the Magi, Christ is shown as a young child, but not as an infant, since the Gospel of St Matthew does not say how long after the Birth of Christ the Magi came to Him. In the Liturgy of the Hours, historical lessons are no longer read at Matins, (now called the Office of Readings,) with a few rare exceptions. For today’s feast, the second reading is a passage from St Cyril of Alexandria’s “Homily against Nestorius”, delivered at the Council of Ephesus in 431. In the Breviary of St Pius V, this passage was read on September 15th, the Octave of the Virgin’s Nativity, but it also makes an especially appropriate choice for the Dedication of St Mary Major. 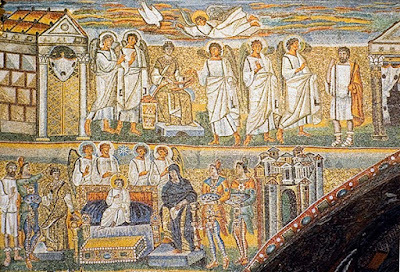 The church was built by Sixtus III, and decorated with mosaic images of the Virgin’s life, in the wake of the great controversy stirred up by Nestorius, the Patriarch of Constantinople, who declared that it was wrong to refer to the Virgin Mary with the title “Theotókos – Mother of God”, and that She ought rather to be called “Christotókos – Mother of Christ.” The Council of Ephesus was called to respond to Nestorius’ heresy, and at that Council, St Cyril was the adamant defender of the orthodox faith, the “unconquered teacher that the most blessed Virgin Mary is Mother of God”, as the traditional collect of his feast calls him. Therefore, rejoice with us, holy and mystical Trinity, that called us all to this church of Mary, the Mother of God. Rejoice with us, Mary, Mother of God, the venerable treasure of the whole world, the ever-shining light, the crown of virginity, the scepter of orthodoxy, the indestructible temple, the place of Him whom no place can contain, Mother and Virgin; through whom is named in the Holy Gospels the Blessed One, who comes in the name of the Lord. Rejoice, thou who in thy virginal womb held Him who cannot be held; through whom the Trinity is sanctified; through whom the cross is called precious and is venerated throughout the world; through whom heaven exulteth; through whom the angels and archangels rejoice; through whom demons are put to flight; through whom the devil, that tempter, fell from heaven; through whom the fallen race is taken up to the heavens; through whom all creation, possessed by the madness of idols, hath come to the knowledge of truth; through whom cometh baptism to them that believe, and the oil of gladness; through whom the Church hath been established throughout the world; through whom the nations are led to repentance. What need is there to say many more things? (This is somewhat ironic, since St Cyril goes on to say a great deal more than can be reproduced here.) Through Thee, the only-begotten Son of God hath shone as a light upon those who sat in darkness and in the shadow of death; the prophets foretold, the apostles preached salvation to the nations; the dead are raised to life, and kings rule through the holy Trinity. 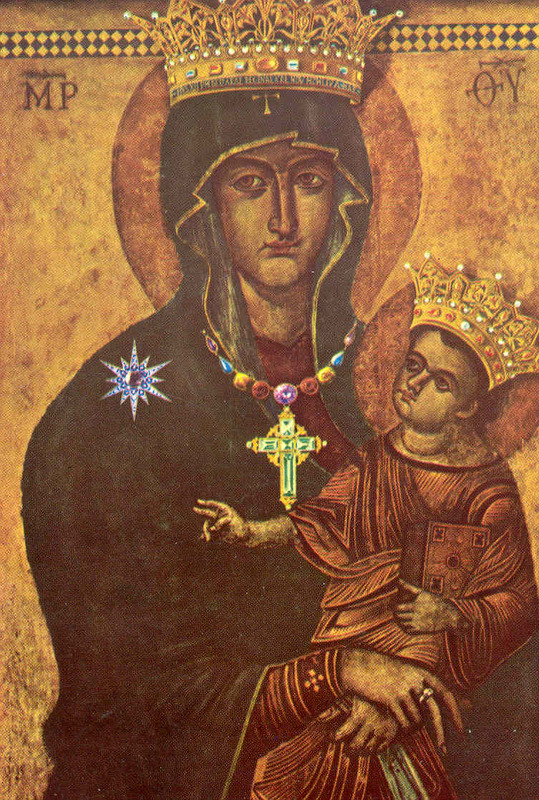 The famous icon of the Virgin Mary titled “Salus Populi Romani,” painted in the 6th or 7th century, and now housed in the Borghese Chapel at Saint Mary Major. The jewels and crowns seen here have been removed in subsequent restorations.